The Surfside is a charming and cozy Cape style house that features three (3) bedrooms and two (2) baths, one full size bath and one half bath. It has comfortable furnishing throughout and includes a large outside deck located on the second level, with additional outdoor seating, a gas grill and outdoor shower. The first floor has a large entrance way, a half bath and laundry closet There are three (3) bedrooms located on the first floor which includes a Master Bedroom with a Queen size bed,TV, large windows and high ceilings. The Guest Bedroom features a Full Size bed with sliding doors that lead to a private outdoor sitting area with gravel style patio. The first floor also includes an additional Guest Bedroom with two Twin Beds with a TV. At the rear of the first floor there is a door that leads out to a picnic table, the large backyard area with hammock and additional outdoor chairs, and the outdoor shower. The second floor features a large open floor plan including the living room, dining room and large modern kitchen and features cathedral ceilings, sky lights and paddle fans, as well as comfortable seating throughout. The kitchen area has granite counter tops, maple cabinets and large kitchen Island. Off the kitchen is the dining area that features two French Doors that lead out to the large second floor deck, that includes a gas grill, additional outdoor seating and stairs that lead down to the back yard. The living room area includes a Plasma TV, and a nearby full bath with tub and shower. The Surfside Cottage can accommodate up to six (6+) guests is located at the end of a private way. 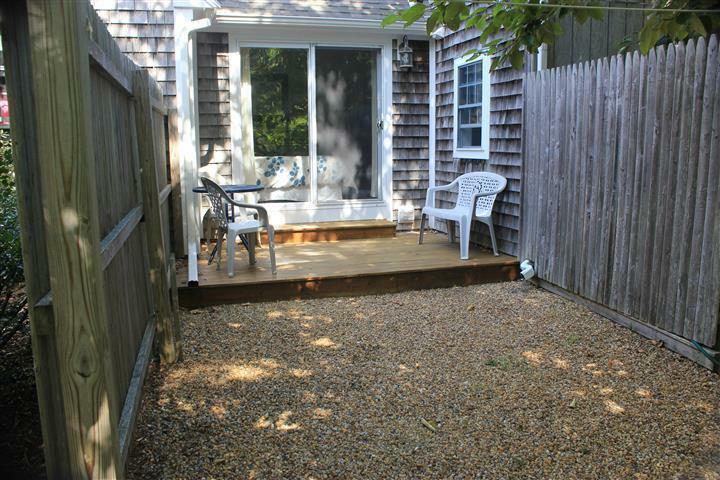 The Surfside Cottage is located two miles south of historical downtown Edgartown and is within minutes to South Beach, the bike path and Morning Glory Farm (an Island favorite). ​The Surfside Cottage can be rented alone or with the Edgartown House which is next door. There are also two additional rental houses within walking distance which can also be rented to accommodate larger parties, including family reunions and wedding parties. Sheet and Towel Info: One (1) Queen Size bed, One (1) Full Size bed, Two (2) Twin size beds, and Two (2) baths (one full size bath and one half size bath).